It's that time of year that we've all been waiting for!! Florida Georgia Line are about to go on their massive US-wide tour, bringing with them support from the incredible Nelly & Chris Lane!! 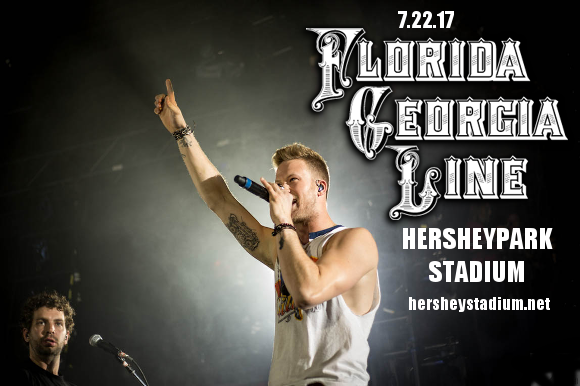 Country favourite duo hit the Hersheypark Stadium on the Saturday 22nd July 2017! Get ready for an unforgettable night by booking your tickets in advance today for this hugely anticipated live performance!! Brian Kelley and Tyler Hubbard met in Belmont University in 2008 through a worship group on their campus, having both previously expressed themselves musically by forming Christian bands and groups. After graduation, the two gave themselves two years to become a successful country act. That’s exactly what they did – and how!! Their 2012 single “Cruise" attracted the attention of major labels and resulted in the pair being signed to Republic Nashville/Big Machine Label Group. The single has since become the best-selling digital country song of all time in the United States, and is the only country song EVER to receive Diamond certification!! After multiple top-charting albums and sold-out tours, Florida Georgia Line are now on tour with their most recent release, 2016’s “Dig Your Roots,” featuring massive names such as Tim McGraw, Ziggy Marley, and the Backstreet Boys!! Their most introspective and thoughtful album yet, “Dig Your Roots,” is an evolved Florida Georgia Line at their very best. What are you waiting for?? Get ready to hear it all in concert – book your tickets to see Florida Georgia Line today! !